In the summer of 1945, one of the productions presented by the Belleville Cathedral Players Guild was the folk comedy, “The Great Big Doorstep.” In this play adapted from the novel by E. P. O'Donnell, a Cajun family in lower Louisiana fished a doorstep out of the Mississippi and then tried to get a house to go with it. The leading lady happened to be making her debut performance with the Guild amid working full-time as a registered nurse at St. Elizabeth’s Hospital. Her name in the play was Mother but for the five years that she performed with the Guild her cast, audience, and hospital coworkers knew her as Dolores Bieser. From a young age, Dolores knew that she wanted to be a nurse, following in the footsteps of several cousins. After graduating from Cathedral Grade School and Notre Dame Academy High School, Belleville, she began her nursing education at St. Mary’s School of Nursing, Belleville. In 1944, she graduated and began her work as a surgical nurse at St. Elizabeth’s – just one block away from her family home – in a hospital where she was born on December 11, 1923. So on a cold night in mid-December 1948, she told her friends and family that she was going to the Convent in Springfield. “Everyone was surprised: my sister cried, my mother was ok, and I held off telling my father until after the ten o’clock news.” On Tuesday, December 28 (the Feast of the Holy Innocents) she arrived at St. Francis Convent. It was a day she will never forget. Although she was taking a big step with this decision, she trusted in God that He would guide her and give her the support when she needed it. She Entered on February 2, 1949 and made her First Profession on October 4, 1951. Immediately after completing the Novitiate, this newly professed Sister was assigned to Alverna Home Nursing Center, Chicago, for two years. This was unusual because the majority of Sisters after the Novitiate were sent for nurses’ training. Since Sister Dolores was already a registered nurse she began her ministry. She then went back to school and finished post graduate studies in Obstetrics at St. John’s Hospital, Springfield, and earned a bachelor’s and master’s degree in nursing education from St. Louis University where she was taught by the Jesuits. The emphasis of her education was in maternal/child studies. She also worked in the Fetal Lab at St. John’s, provided Family Assistance to mothers and families, and volunteered at the Pregnancy Care Center, Springfield, where she used her nursing experience to answer the questions of expectant parents. Currently she serves as the Chairperson for the Sisters' Committee at St. John's. She also volunteers in the Third Age Living Department on Mondays making phone calls to seniors to check on their well-being and send a message of care and concern. “This phone call keeps many seniors in touch with our services and encourages them to call when they need assistance. If the Department has not heard from a particular senior in a while, Sister Dolores will make a phone call and tell them we are thinking of them, praying for them, and encourage them to call when they need anything,” said Linda Cordery, St. John’s Administrative Assistant. 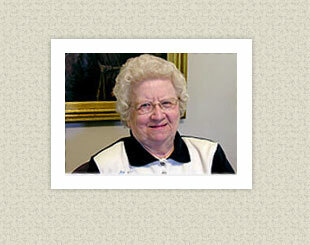 “Sister Dolores is a fun-loving joyful individual who is always pleasant to be around,” Linda added. “During the 1960s, the song “Born Free” was my absolute favorite,” Sister Dolores explained. “As I reflect today, 58 years later after entering the Community, it is in the freedom of the Spirit that continue to journey and live in the joy and spirit of being free,” Sister Dolores said. This leading actress/cook/party-planner/reader of novels has learned perseverance, faith, and trust, and while she admits to being an extrovert, she has become an introvert in her prayer life. “I have a down-to-earth relationship with God and it works for me. I have learned that as I meditate on the Psalms in my room, I have a solid connection with God who is very real to me,” she said. Hers is a matter-of-fact message for all of us: Be happy in your life because the reward is great.